Travel times in the U.S.: Moving by road, canal, boat, and airplane in the 19th and 20th centuries (MAP). These maps, published in 1932 in the Atlas of the Historical Geography of the United States and available through the David Rumsey Historical Map Collection, illustrate how arduous travel was in the country’s early history. In 1800, a journey from New York to Chicago would have taken an intrepid traveler roughly six weeks; travel times beyond the Mississippi River aren’t even charted. Three decades later, the trip dropped to three weeks in length and by the mid-19th century, the New York–Chicago journey via railroad took two days. And the introduction of regional airlines in the 1920s made it possible to travel 1,000 or more miles in a single day. Prior to 1800, sea routes, rudimentary postal roads, and a few navigable rivers—none of which linked the East Coast to lands beyond the Appalachian Mountains—were the only ways to cover long distances. At the turn of the 18th century, New Englanders began constructing thousands of miles of toll roads that allowed for faster travel and wouldn’t become impassable with heavy rain or snow. The development of railroads—as well as canals, many of which were never finished or were made obsolete by the railroad—in the 19th century brought an increasingly complex and speedy transportation system to the country. Cities such as Chicago—a dusty military outpost and frontier town until the mid-1800s—became booming centers of commerce and population growth thanks to the expansion of railroad and river routes. Nowadays, travel by car—via our interstate highway system, which first received funding in 1956—from New York to Chicago takes roughly 12 hours. The rise of major commercial airlines in the mid-20th century kicked off Americans’ reliance on air travel. A direct flight from La Guardia to O’Hare will now set you back just 2½ hours, excluding TSA pat-down time. Click on the image below, or on this link to the map’s page on the David Rumsey site, to arrive at a larger, zoomable version. 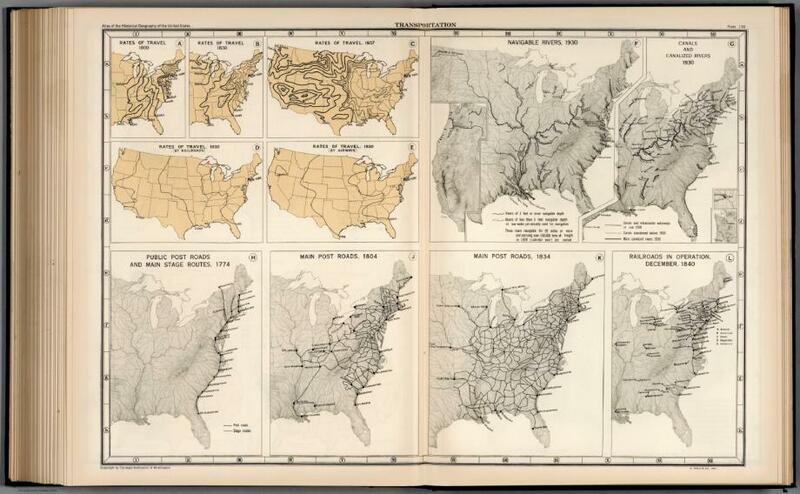 “Rates of Travel, 1800-1930.” Atlas of the Historical Geography of the United States, by Charles O. Paullin, ed. John K. Wright, published by the Carnegie Institution and the American Geographical Society, 1932. David Rumsey Map Collection.